5 gallon fish tanks can add a stylish and sleek look to your home and there are lots of styles and designs available. Surprisingly, there is a wide range of fish and invertebrates that you can keep in a tank this size. What Fish Can You Keep In A 5 Gallon Fish Tank? 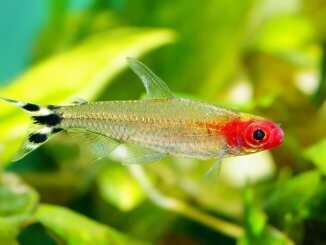 5 gallon aquariums are the smallest tank that we recommend you keep fish in. Due to the tank’s size, they require a lot more care and maintenance when compared to larger tanks. This is because with smaller bodies of water, the ammonia and other toxins can build up quicker which can be toxic for your fish. So, if you want to keep a small tank, you should be prepared to carry out weekly water changes and monitor the water parameters carefully. Most tanks are around 16 x 8 x 10 inches in size. Due to the size of the tank, there are limited amounts of fish that you can keep in them, one of the more common options is to keep snails or shrimps. A stylish modern looking aquarium with rounded corners so you can enjoy the view of your fish from all angles. This is a beautiful tank which will look great in any room of your home. 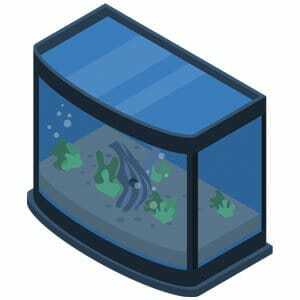 With rounded corners, your view will be unobstructed when you watch your fish swimming around. It has a hidden three stage filtration system, behind the back panel. The light is on a hinge so you can light it up for easy access when cleaning the tank. The lighting system also has a daylight and moonlight setting to replicate your their natural habitat. The white LEDs replicate the sunlight, whereas the blue LEDs create a moonlight glow. On the top of the tank there is a glass canopy which slides on and off. Product dimensions: 11.8 x 11.6 x 17 inches. Tank is very simple to set up. Portrait orientation allows you to grow tall plants and take up less counter space. You have to lift the light up to clean the tank out. Feeding the fish requires you remove tank cover. The filter area is narrow and difficult to clean. A good quality aquarium perfect for aquarists looking for a complete kit with everything you need to get started. 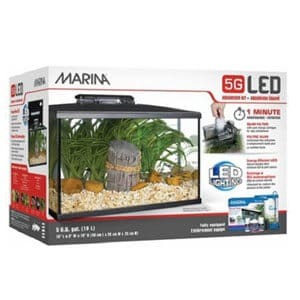 The Marina LED Aquarium kit is a well-constructed, quality tank which is popular amongst all aquarists. It has black silicone sealed edges, and a hinged lid which opens and allows you to feed your fish and clean the tank out. This tank comes with LED lighting, a hang on back filter, fish food, water conditioner, biological supplement, a net and an aquarium guide. The lighting is built into the canopy, and LED lights are used to ensure they are long-lasting. Product dimensions: 18.5 x 10.8 x 13.3 inches. Three different sizes to choose from if you decide you want a larger one. The hang-on-back filter is quiet. Bright lights which enhance fish colors. Reputable company with great customer service. You’ll need to buy a heater if you want tropical fish. Design makes it difficult to add your own equipment. Lights are attached to the hood, so if you need to remove the whole hood, there are no lights. This aquarium glass tank is ideal for those who would like to add their own equipment and design their own setup. This all glass aquarium is made from triple strength, clear glass which is held together with a quality silicone rubber seal. 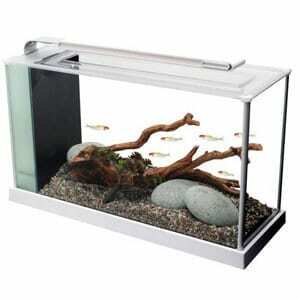 The top of the aquarium has a frame which is designed for a recessed cove; available separately. This tank is perfect for experienced aquarists who already have their own equipment (filters, covers etc.). The company who sell this product offer an unconditional guarantee – meaning you can return the product if you are unsatisfied for whatever reason. Product dimensions: 16 x 8 x 10 inches. Well wrapped and protected during delivery. Seal is neat and professional. You have to buy a lid separately. Comes with adhesive sticker which is hard to remove. You need to add all your own equipment. 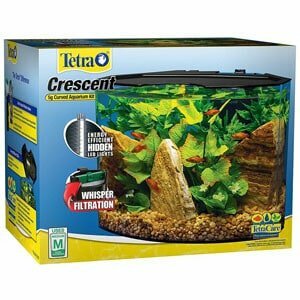 A strong and durable curved acrylic tank which comes complete with a filter and lights. Tetra is a well-known brand throughout the fish keeping world, and for good reason. They create high quality tanks that are built to last. 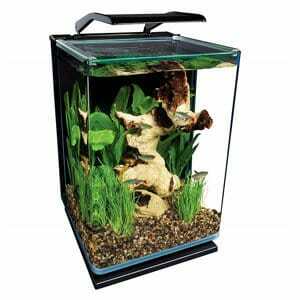 This particular tank comes as a complete kit with LED lighting, filter, lid and base frame. The 16 LED lights are environmentally friendly, and create a soft shimmer in the water so they’re not too bright and dazzling. With a curved front, this tank gives you an undisturbed view of your fish, and looks modern whether you decide to put it in your lounge, kitchen or bedroom. Product dimensions: 16.6 x 11.2 x 13.2 inches. Space to add a heater with suitable cut outs in the lid. Easy to set up and simple instructions. Includes water conditioner and biological aquarium starter. You’ll need to buy a heater if you want to keep tropical fish. Large feeding hole which is dangerous for jumpy fish. 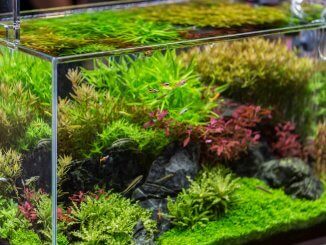 If you’re looking for a top of the range, contemporary-looking aquarium which will look stylish in your home, this is for you. This aquarium is great for beginners and experts alike. It is available in black or white, and will be the focal point of your room as it is quite different to other standard aquariums. The sleek overhanging lighting system has 37 powerful lights. It also comes with a 3 stage filtration system and all the filter media which is needed for it. Along with the filter, there is also a pump which is hidden away in a separate compartment at the side of the aquarium. Product dimensions: 17.2 x 10.6 x 6.3 inches. Fluval customer service is excellent. Filter and pump in one area which makes maintenance easy. The light is bright and great for aquascaped tanks. 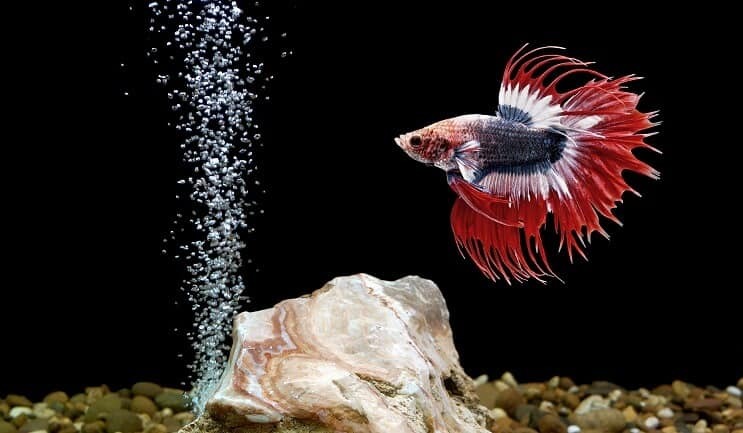 The filter is too powerful for Betta fish, so you’ll need to order a pre-filter sponge. You will need to add a heater if you want tropical fish. At a bare minimum, you will need a filter and lights for your fish tank. Depending on the type of fish you choose, you might also need a heater. A filter is needed for a tank of this size – remember, the smaller the volume of water, the faster toxins can build up. The filter will get rid of toxins that are lethal to your fish and they will also remove detritus from the water. Ideally your filter should be a chemical, mechanical and biological one which isn’t too powerful – you don’t want to create a strong current in a small tanks. If you choose to keep tropical fish, you will need a heater to make sure the water stays at a consistent warm temperature. Most tropical tanks should be heated to 75-80°F. Choosing to keep tropical fish will massively increase the number of species which you can keep. There are a much larger selection of tropical fish compared to cold water fish. Most importantly, they encourage and promote plant growth and help to regulate a day/night cycle for your fish. Secondly, they light the aquarium up for your viewing benefit to enhance the colors of the fish and plants. The strength and wattage of the light will depend on the species of fish and plants which you keep. Some plants prefer dim lighting, whereas others prefer brighter light. To finish setting up your tank, you will need substrate and decorations. Most people tend to use either a gravel or sandy substrate. Again, this depends on which fish you’re keeping and what they are used to in their natural habitat. Next, you can add plants and decorations. Live plants are very beneficial for fish tanks as they produce oxygen and absorb the ammonia that your fish create. To keep your tank clean, you will need to use a gravel siphon to remove any large particles which the filter hasn’t managed to clear. You also need an algae magnet to clean the glass. Once your tank is completely set up, you need to cycle it before adding fish. We will cover setting up your tank, and the species of fish you can keep in a tank this size. 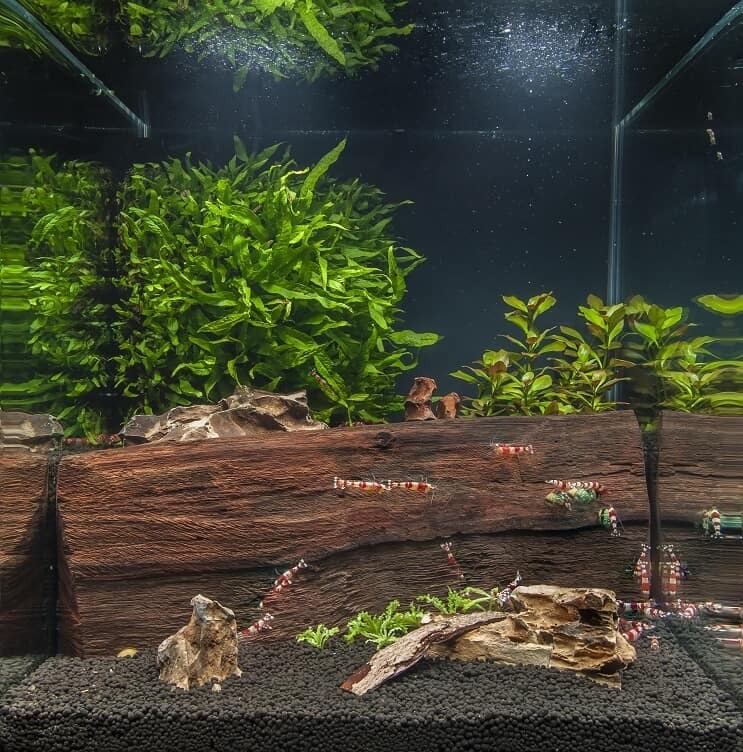 Small bodies of water build up pollutants much quicker than larger fish tanks do, so you’ll need to be careful that you don’t overstock your tank and only keep a small amount of fish, snails or shrimps. Here are a few different setup suggestions for your 5 gallon tank. The most common use for a 5 gallon aquarium are Betta Fish. In your Betta tank you can keep one male Betta, a nerite snail and a ghost shrimp. You might also want to include some plants such as Anacharis or Java Fern. 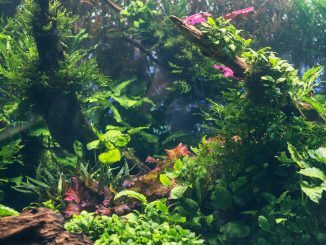 Aquascaping a tank can give the illusion that the tank is bigger than it actually is, however there is an art to creating a beautiful underwater landscape. Perhaps you don’t want to keep any fish in your aquarium. All snail, or all shrimp setups can be quite unique and one-of-a-kind. You can include one or two snails in a five gallon tank, or around 5-7 shrimp. You might have heard the rule, that you can keep “one inch of fish for every gallon of water you have”. Whilst that rule applies to smaller, peaceful species, it can’t be applied all the time. For example you could not keep a 5 inch goldfish in a 5 gallon tank. You need to consider how large the fish will grow to make sure that they won’t outgrow the tank. You might find other places recommending a wider selection of fish such as Goldfish or Guppies. However these fish often need much more space for a couple of reasons. Firstly, any fish that grows too big (such as Goldfish) will suffer in a 5 gallon tank. Secondly, some small fish (such as Guppies or Tetras) need to school, so keeping a couple in a small space will cause them to become stressed. If you want to keep larger, or schooling fish, consider getting a 20 gallon tank instead. The first thing you need to do is choose a level area, away from any windows or heat sources. Once the tank has water in, it can weigh up to 10 times the amount of an empty tank so it’s difficult to move. Put in the gravel, and then all the electrical equipment. Fill the tank with water and add the water conditioner. You can then add any plants and decorations to the tank. 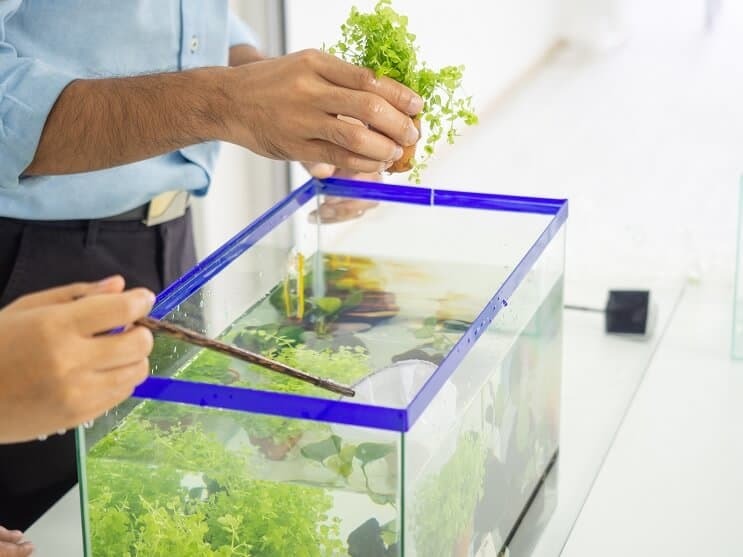 Setting up your fish tank is the simple part that most people know how to do. The part that most people miss is cycling the tank. This means allowing the tank to build up a bed of good bacteria which will help convert ammonia and nitrites into nitrates. Nitrates are less harmful for your fish, and can be removed during the weekly water changes. You don’t need to do anything to start this process – the nitrogen cycle is a natural process which will happen on its own. Once the ammonia and nitrites have spiked and dropped back down to zero, the tank will be ready to add fish. This is usually 4-6 weeks after setting the tank up. The most important thing to remember is that 5 gallon tanks are not suitable for beginners. Because they are so small, the water can become toxic very quickly. Therefore we advise that you only keep a 5 gallon fish tank if you have some previous fish keeping experience. This tank size is great if you want to breed fish, or have a nano setup. If you’re a beginner, and would still like a small tank, try a 10 gallon fish tank instead.